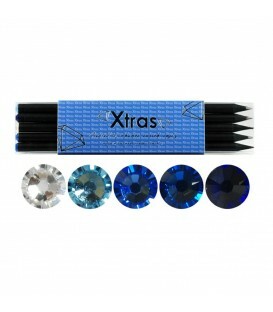 A new line of packaging for the Swarovski® Elements Crystal pencils will soon be available. The 5 Piece Sleeve packs are the perfect gift item, containing 5 pencils in each of the 3 matched colour combinations. The Pink pack comes in five shades of pink, because you just can’t have too much pink! A Blues pack that emulates the changing mood of the sky from translucent & pale to the rich deep blue of space and last but not least the five piece Pastel pack that will thrill Pastel lovers with its five smooth subtle shades.